The State Department’s Bureau of Public Affairs recently hosted a conference call with Ambassador Samantha Power, U.S. Ambassador to the United Nations, and representatives of African diaspora communities from across the United States to discuss the international response to the Ebola crisis. Officials from USAID, the National Security Council (NSC) and the Centers for Disease Control (CDC) joined the call, the third in a series hosted by the Bureau of Public Affairs with the African diaspora community. These calls have provided an opportunity for the U.S. government to coordinate effectively with diaspora communities across the United States to combat this epidemic and to connect individuals seeking to volunteer in various capacities with the NGOs working directly in the Ebola-affected communities in West Africa. In October 2014, Ambassador Power traveled to Guinea, Sierra Leone, and Liberia to demonstrate U.S. support for these nations, review the response effort and emphasize the need for increased support for the international response. Ambassador Power stressed that, despite the gains seen in Liberia, Ebola remains a major threat and she also warned of the risk of complacency. She also noted that in Sierra Leone, the disease continues to spread at a rapid pace. Some 18,000 people have been reported infected in West Africa and 7,000 people have died. And the economic and social toll of the disease is staggering. The outbreak has caused profound suffering and long-lasting effects on the lives of the people of West Africa. Ambassador Power reinforced that the U.S. government understands what it takes to end the epidemic, and that it is a matter of “mobilizing resources and will.” The U.S. response has been the largest to any global health crisis in history. Currently, there are 3,000 U.S. government personnel in the region working to curb the spread of the epidemic. Even with this robust response, the United States alone cannot curb the epidemic’s deadly spread. 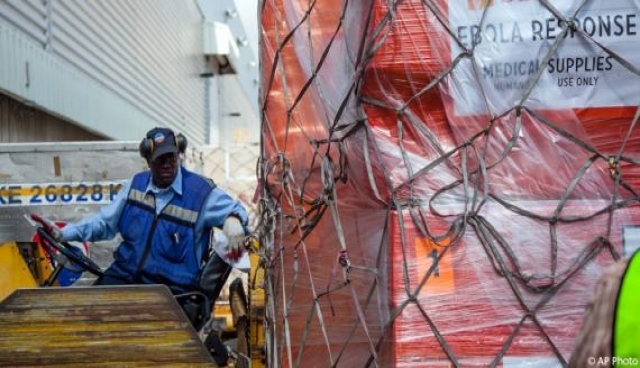 Other countries have joined the response effort as well, including the United Kingdom which has committed somet 230 million pounds to tackle Ebola. Diaspora representatives, grateful for the opportunity to share their views, were eager to ask questions on how their community can assist with responding to the needs of those in affected countries. Thanking the Obama Administration for its response to the crisis, one diaspora representative originally from Sierra Leone asked Ambassador Power to identify how the diaspora can be engaged in Sierra Leone. Prefacing her response to the caller with “we need you,” Ambassador Power underscored the vital role the diaspora can play in education, social motivation and galvanizing the diaspora community to help those in Sierra Leone where behavioral change is slower than in Liberia. Ambassador Power emphasized that the diaspora have a critical role to play in carrying messages back to relatives in West Africa and helping with the response. With their sophistication, will, and capabilities, they are uniquely positioned to helping conquer the fears and stigma that the epidemic has generated. Ambassador Power ended the call by urging the diaspora community to continue to put their skills to work in ending this outbreak and to know that they have the support of the U.S. government as they work to eradicate this deadly disease.